One of the most demanding layouts in world golf, the Oakmont Country Club was founded in 1903 by Pittsburgh industrialist Henry C. Fownes. An accomplished amateur golfer, Fownes designed the course himself on rolling pastureland he had purchased north-east of the city. Together with son William, he then spent the next 30 years refining and strengthening his holes, polishing the layout into the internationally respected jewel we see today. Initially inspired by the open linksland of Britain, Oakmont was built to be a strong but uncomplicated course that would reward accurate hitting but punish severely those who stray. Both father and son believed that golf needed to be difficult in order to remain interesting, and were equally convinced that bunkers were the game’s most appropriate hazard. Much of their work, therefore, involved adding bunkers including the notorious Church Pews, which the younger Fownes created during the 1930s. They also built some of the finest and most treacherous green sites anywhere in golf. The quality and variety of their greens work is truly extraordinary with the targets leaning in every direction and shaped to demand golfers attempt all manner of approach shots and from a range of different lies and angles. 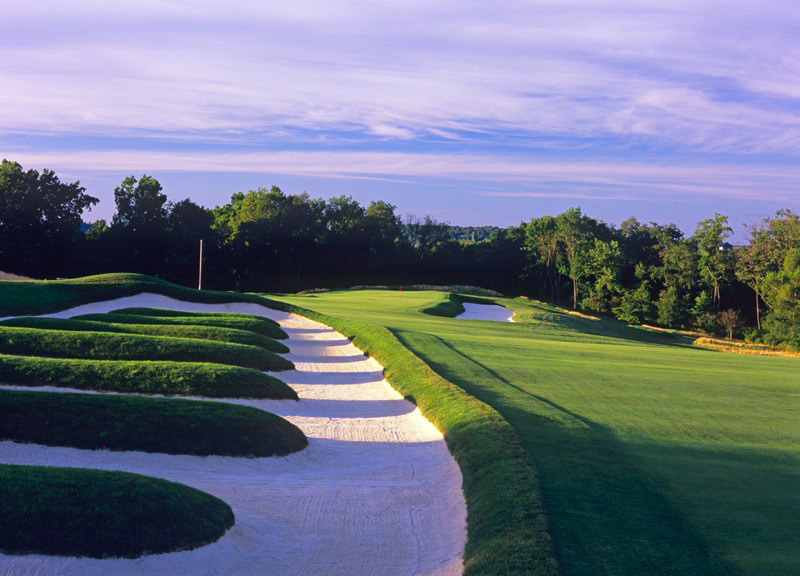 Divided in two by the Pennsylvania turnpike, Oakmont features a two-loop routing that flows beautifully across the sloping terrain in much the same manner as it did when first arranged. The holes are now longer, narrower and more heavily bunkered, but structurally it hasn’t change in over a century. The difficulties here are apparent from the very outset, the opening fairway pinched uncomfortably tight by sand and noted for a semi-blind approach that heads over a crest toward a fast green angled sharply away from play. Following a short uphill par four with a steep green and a stack of penal bunkers, comes the world-famous 3rd, a magnificent two-shotter that climbs steadily up a small hill toward an attractive away-sloping target resting atop a plateau. 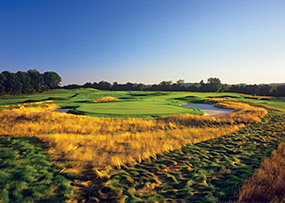 The hole is, of course, best known for the Church Pews, a unique wasteland bunker divided by a series of grassy ridges that guards both the left side of this fairway and the adjacent par five 4th. These ridges were created to ensure players hitting into the enlarged trap were duly punished and although a series of bunkers would serve the same purpose there is no denying the aesthetic appeal of this distinctive feature. Other great areas on the front nine include the crested par four 7th, with its strategically leaning green site forcing brave golfers to chase their ball through sand in order to get near certain hole locations. The 8th is then a classic half-par hole that pushes 300 yards from an elevated back tee, its inviting target protected by a long Sahara bunker that can either be attacked or avoided according to one’s ambition. Standouts on the back nine include the horrendously tough approach into the 10th, which must be flighted perfectly as both the fairway and green fall away to the left forcing you to either flirt with right-side bunkers or try hitting a controlled fade from a draw lie. The front-to-back putting surface on the long par five 12th is also exceptional, while the par four 15th is rightly celebrated for an awesome side-hill approach heading into an immense target that is angled toward an elongated bunker and full of cunning breaks. The closing stretch is also very strong, particularly the picturesque 18th and its deep fairway bunkers, softly rising approach and boldly contoured green complex. 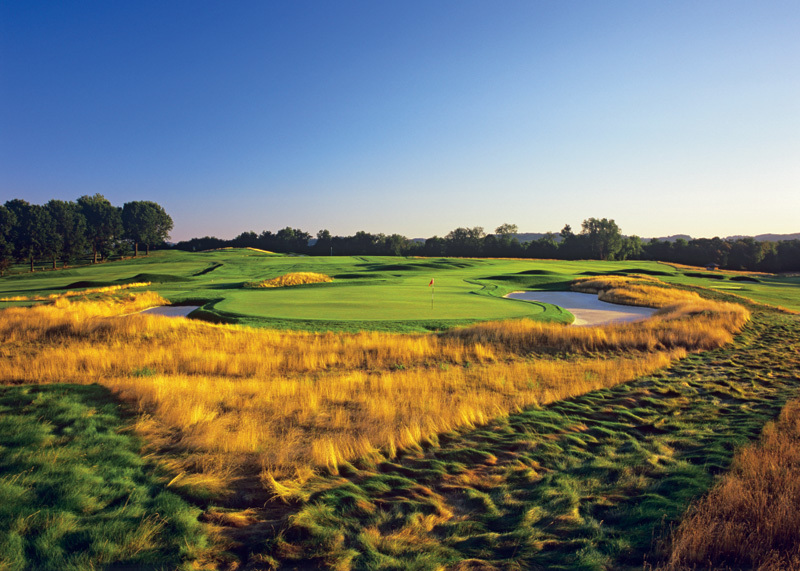 The key difference between a course like Oakmont and other penal layouts is the variety of the Fownes design and the number of outstanding individual holes they managed to create. Unusually for its vintage, this course was always intended to be brutal and one has to admire the club for adhering so stringently to the early design philosophies as it continues to pinch fairways, add back tees and reposition bunkers. They did famously lose their way during the 1960s when thousands of trees were planted through the interior of the course, but thankfully these have since been removed and the vistas and open characteristics of the site restored. Although it’s probably too demanding for many who aspire to play here, for the skilful golfer Oakmont provides the ultimate examination of their ability to think clearly, hit accurately and putt truly.